Okay, from February to June (barely) is a long break in blogging and for that I apologize. In my own defense, I have to tell you we moved from Houston to Los Angeles. And since this wasn't a company move, it was all on us and we had many years of accumulated stuff to go through and organize and get rid of. What a job! We moved into a place that's one-fourth the size of our house in Houston so the getting rid of part of the job was most important. I just wonder why we waited so long to do this. I love being here. I love being near by one daughter and grandgirl. And the other daughter is at least in the same state! We've become great friend with the 2 yo Ruby. What a gem she is, too. We babysit every Tuesday because her mom teaches yoga then (hence, our very own Ruby Tuesday). And last weekend we babysat while her parents took a well-deserved mini-vacation. It was our first sleepover with Ruby and did we ever love it! She's an amazing child -- bright, funny, quirky, silly, cute as the dickens and has a mind of her own (don't all 2 year olds?). 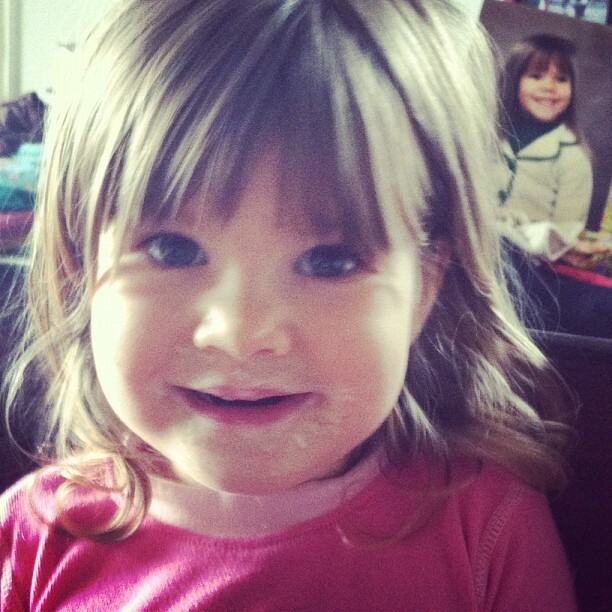 I love this photo of Ruby with yogurt all over her face and a picture of her mom at the same age in the background. They're both cute little girls! As for the beading world: At the end of February, Mandy came to visit!!! It was the best. We met through her blog, Beads for Brains, and became online friends, really good friends. It was a little unnerving for us both to have this meet up. What if we didn't like each other in person? Well, that was SO not a problem. We had fun, took a beading class, made bracelets, started a Nancy Dale type Color Play piece. The only problem with the visit was that it was too short! An added bonus was that Mandy & my hubby got a long like old friends, too. Lovely! 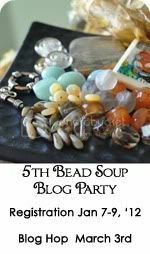 I've signed up for Lori Anderson's Bead Soup Blog Party to force myself back into blogging and beading. My partner is Sheryl Stephens at The Babbling Beader. She has WAY more experience than I in beading but she and I have found connections that are really kind of amazing. We've even made some bracelets that are very much alike! How cool is that? Lori must have been pulled by some strange strings in the Universe to pair us up! I love that and am looking forward to our partnership. Welcome back to blog land! can't wait for saturday! Ruby is adorable - it's great that you are near her!!!! Your recent months are sounding so very much like my upcoming months! Glad you signed up for the BSBP! Yay! I think all beaders are hoarders of some kind - whether it be just beads, or other crafty stuff too. I also crochet, and have done cross stitch and embroidery in the past - so you can bet that if there is a spare closet or cubby in this house, it's got CRAFT stuff in it! Thanks for the shout out about the Soup Challenge, too! Can't wait! Sally it's so nice to hear from you again. I've been wondering about you - whether or not you had made the move to CA yet. I see you have. How wonderful for you to be near your family - btw your little Ruby is adorable. Take care. Yeah you blogged! Let's get to it sista, we've been dormant long enough!!! Love you! Hi Sally! I just saw your comment! I have no idea why you aren't seeing my posts anymore! I haven't changed anything on my blog. Did you start using a different folowing service? I honestly don't know how half of that stuff works,so I'm the wrong one to ask. All I can think is that if there's a way to "unfollow" try that and then follow again??? Like I said, I don't have a clue. Are there any other blogs you're missing? Maybe you can search the blogger "help" site? let me know! Well I'm still getting caught up on blogposts reading after last week's power outage plus travel, so a belated welcome back to the blogosphere!